High res: TIFF. Also: MPEGs (256x256, 512x512), QuickTime; All LASCO C3 NEAT images. SWAN image showing the paths of comets NEAT (red markup) and Kudo-Fujikawa (green markup). The MPEG shows the period from December 1, 2002 - March 11, 2003, first forwards, then backwards ("swing" mode). Also appearing is C/2002 Y1 (Juels-Holvorcem)! Caption: Although comet NEAT (C/2002 V1) was not visible in the LASCO images until about 16:00 (Universal Time) on February 16, it had in fact been tracked by SOHO since December 31 last year. 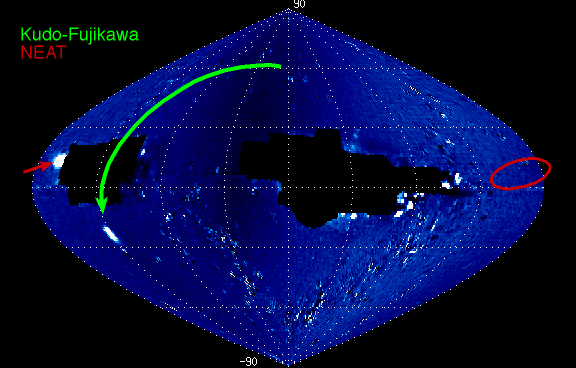 The color markup on the SWAN image (bottom) shows the paths traced out by the two comets NEAT and Kudo-Fujikawa. The red ellipse indicates the area where comet NEAT first becomes visible. As it disappears "over the edge" of the map, it enters on the other (left) side. The LASCO pictures and movies of this comet are quite out of the ordinary, with a sizeable tail and a very bright (saturated) comet nucleus. We even got a nice Coronal Mass Ejection (CME) off the west limb close to perihelion time, putting the icing on the cake for this movie! 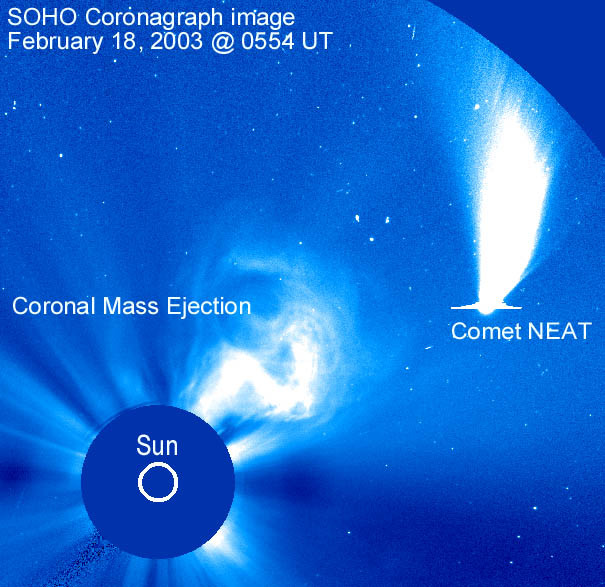 LASCO also made special observations with extremely short exposure times during the passage, to increase the likelihood of spotting a possible fragmentation of the comet due to its close approach. These images will not be published here (but they will appear in the SOHO Archive along with all the other SOHO data. No fragmentation was observed. The SWAN instrument scans the whole sky using two periscopes (on each side of the spacecraft), looking at how diffuse, slow-moving neutral hydrogen glows in the light from the Sun. In order to protect the instrument from much stronger light than that of the diffuse gas, patches of the sky close to the Sun cannot be observed; the Earth and certain protruding parts of the spacecraft (e.g. solar panels) also has to be avoided - hence the two distinct cut-out sections in the image. The SWAN image & movie above projects the full sky map in ecliptic coordinates, so anything that moves in this type of movie is moving relative to the stars as seen from SOHO. Comets can be seen by SWAN because their water ice evaporates as they are heated by the Sun. The water in turn is split into oxygen and hydrogen by the radiation from the Sun. The resulting hydrogen cloud is denser than the diffuse gas normally observed by SWAN, so it stands out clearly in their full-sky images, in particular after removing the signal from stars and a smooth background component.